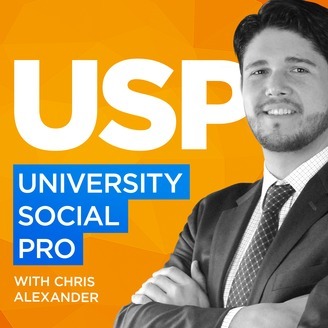 The goal of University Social Pro is to bring you inspiring and illuminating conversations with social media and digital marketing professionals working in higher education around the United States and the world. Every other week, we deconstruct cases and examples of marketing tactics used to serve students, faculty and staff, with the aim of providing practical and actionable insights to those just starting out in social media and digital marketing. I recently had the wonderful opportunity to present at the 2016 Higher Education Social Media Strategies Summit in Boston, and was fortune enough to team up with my friend and fellow NYU colleague and super mega accomplished podcaster, none other than Chris Barrows. Chris is the host of the Why I Social Podcast as well as the Five Favorites podcast, and for this conference, we teamed up for a presentation called “Podcasting for Higher Education”. We talked about the podcasting landscape in general, what we think is a massive opportunity for podcasting to be an important part of the Higher Ed marketing mix, and we also went over the building blocks, blueprints and gear that one would need to get started. 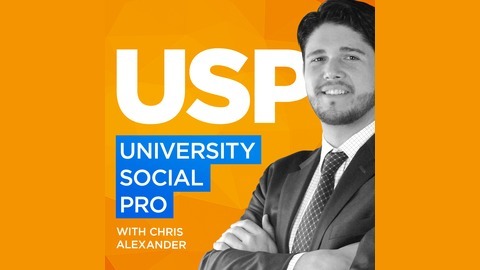 Now, seeing that this is an audio-only format, I posted both our presentation slide deck as well as our Podcasting guide cheat sheet for you to read and download at universitysocialpro.com/session14. So please go there and check that out, if you’re interested in this stuff, it will really give you a simple, idiot proof guide to getting started. One last thing before we dive in, please excuse the non optimal audio - this was recorded live in a conference hall in Boston, so I did the best I could with the enhancing the audio so that it’s a little more gentle on your eardrums - and with that disclaimer, here we go with the presentation.